스펜서 보나벤터 트레이시 (영어: Spencer Bonaventure Tracy, 1900년 4월 5일 ~ 1967년 6월 7일) 는 미국의 영화 배우이다. 폭스 필름을 거쳐 메트로-골드윈-메이어를 거쳐 이후 연기 생활까지 50년 동안 좋은 연기를 보였으며 캐서린 헵번과의 로맨스로도 유명하다. 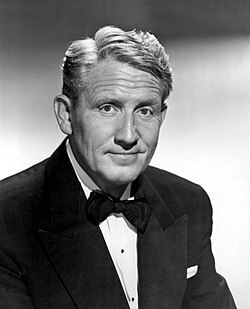 Spencer Tracy in the Wisconsin Birth Records, 1900 US Census, 1905 Wisconsin Census, 1910 US Census, Ohio Marriage Records, 1930 US Census, and Social Security Death Index. 이 문서는 2019년 1월 20일 (일) 10:00에 마지막으로 편집되었습니다.